Aberdeen were beaten 3-2 by Rangers in a game which both sides finished with 10 men. The pair, who were involved in a similar flashpoint in the Granite City on the opening day of the season, were sent off 10 minutes into the second half for lashing out at each other. Morelos had earlier netted twice and James Tavernier had scored from the penalty spot, with Sam Cosgrove adding a brace of his own, in a powder-keg atmosphere in the north-east. Jermain Defoe bagged a late fourth for Rangers but Kilmarnock’s draw with Dundee mean Derek McInnes’ men remain in third place on goal-difference. McInnes sprung a surprise by recalling McKenna at the back, who had been missing with a hamstring injury since the Kilmarnock game and had not been expected to feature until the Queen of the South Scottish Cup tie on Sunday. Cosgrove and Joe Lewis were both passed fit after coming off against Hibernian, while Tommie Hoban was deployed as a holding midfielder. 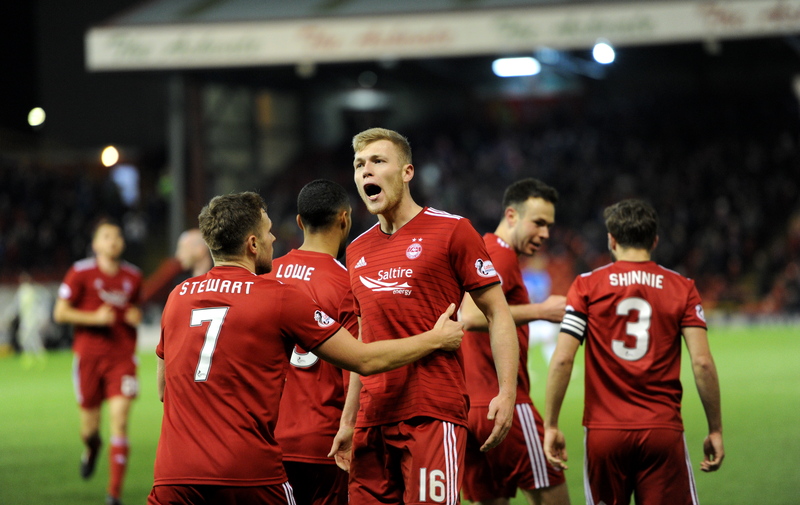 Greg Stewart rattled two early chances over for the home side, following lay-offs by Gary Mackay-Steven and Andy Considine, as the Dons sought an early opener. Sam Cosgrove levelled for Aberdeen. However, it was Rangers who struck first 20 minutes in, thanks mainly to Ryan Kent. The on-loan Liverpool man escaped Shay Logan’s attentions on the edge of the box before driving past McKenna, forcing Lewis to parry into Morelos’ path. He had the simplest of finishes, rolling into an unguarded net. Cosgrove marked his start with a goal on 31 minutes, reacting well after Lewis Ferguson’s shot was blocked by James Tavernier and Connor Goldson. Goalkeeper Allan McGregor was floored, allowing Cosgrove to roll into the far corner. The lead was restored just seven minutes later, as former Don Ryan Jack freed Kent and his first-time pass found Morelos, who slid it back across Lewis into the far corner. Rangers extended their advantage to 3-1 before the interval in controversial circumstances. Four days after getting four penalties against St Mirren, the visitors received another, this time from referee Bobby Madden after Goldson deflected Tavernier’s cross into McKenna’s arm. Gers skipper Tavernier beat Lewis from the spot. If they felt aggrieved by the first half, the Dons wasted little time in putting it right in the second. Cosgrove got his second of the night and 14th of the season three minutes into the second half, converting from the spot after Tavernier hauled down Ferguson. 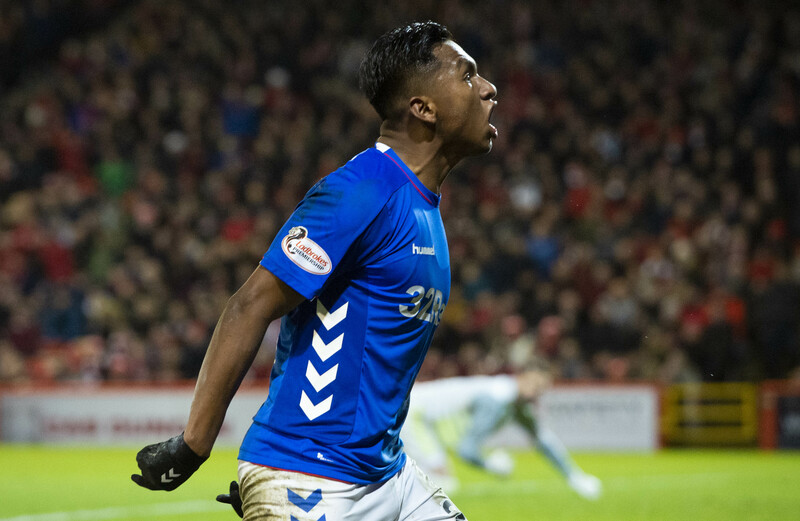 Alfredo Morelos was sent off in the second half. 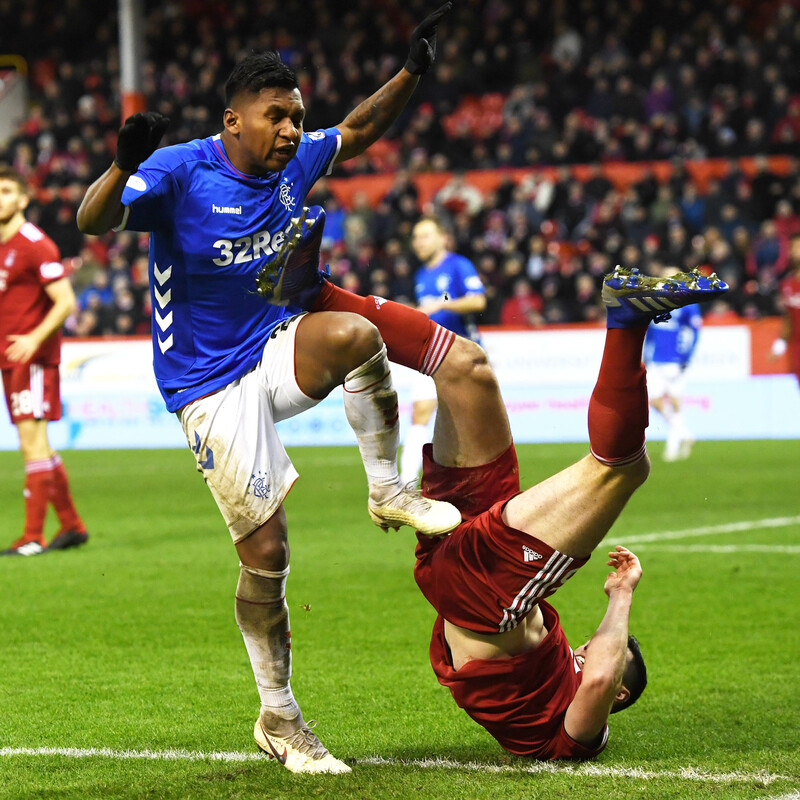 Both McKenna and Morelos saw red 10 minutes into the second half – after tangling in the corner, Morelos appeared to stand on the thigh of the Aberdeen defender, before McKenna retaliated by lashing out at the Colombian. Madden duly gave both red cards, the third time Morelos has been sent off against the Dons this season and the second time for an incident with McKenna. 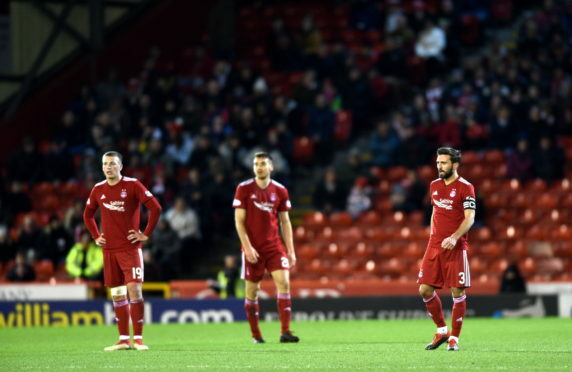 Aberdeen responded by bringing on James Wilson for Logan and playing three at the back, with Max Lowe tucking in alongside Considine and Hoban. Alfredo Morelos and Scott McKenna tangle. McGregor was perhaps lucky to escape punishment for his studs-up challenge on Ferguson, after claiming the ball ahead of the on-rushing Aberdeen midfielder. Gary Mackay-Steven and substitute James Wilson both went close for the home side as they chased a leveller. Aberdeen laid siege to the Rangers goal late on, with McGregor blocking a goal-bound attempt from Hoban, but Defoe slotted away the fourth in stoppage-time to seal their first win over the Dons this season.